“Long Peak” Glacier is an unnamed glacier southeast of Juneau, Alaska. 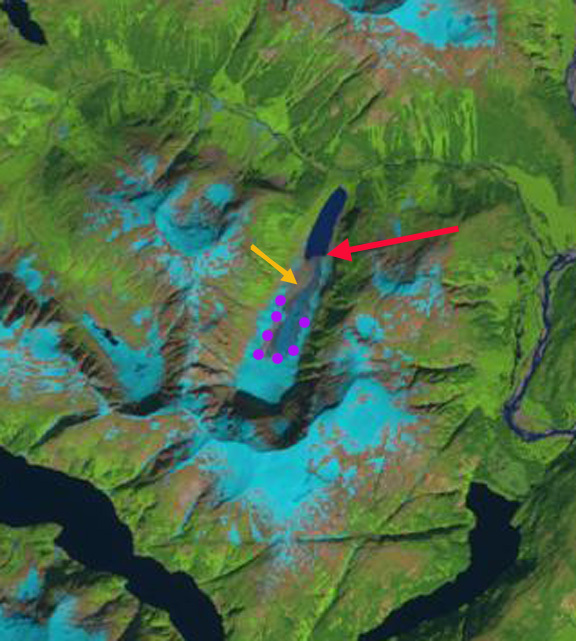 The glacier occupies a narrow northeast oriented avalanche fed valley, light blue arrows indicate the avalanche feeding regions around the glacier. 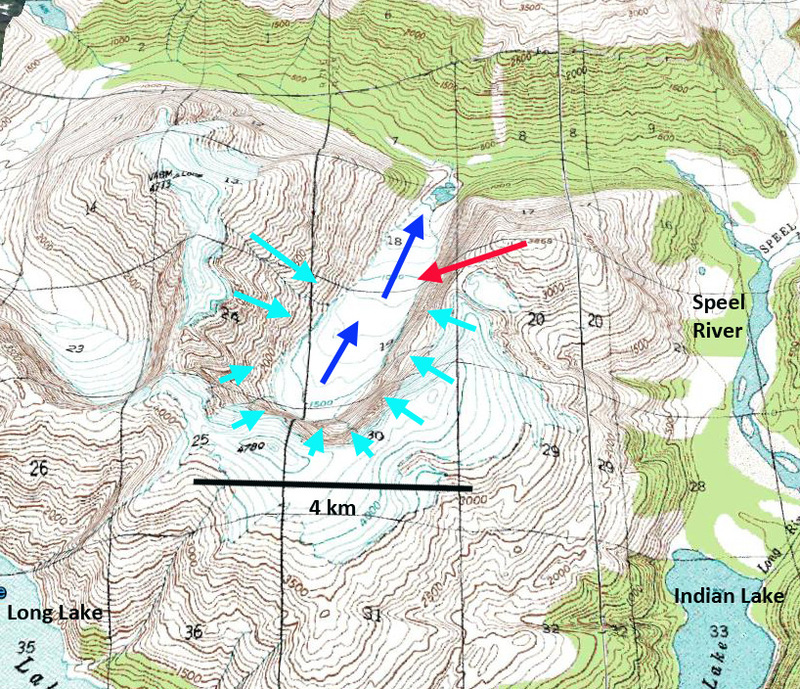 In 1948, as indicated in the USGS map,the glacier extended from 1600 m to 500 m, a small lake is shown at the terminus, with an overall length of 3.8 km. The glacier is a short distance southwest of the retreating Speel Glacier, and it does drain into the Speel River. 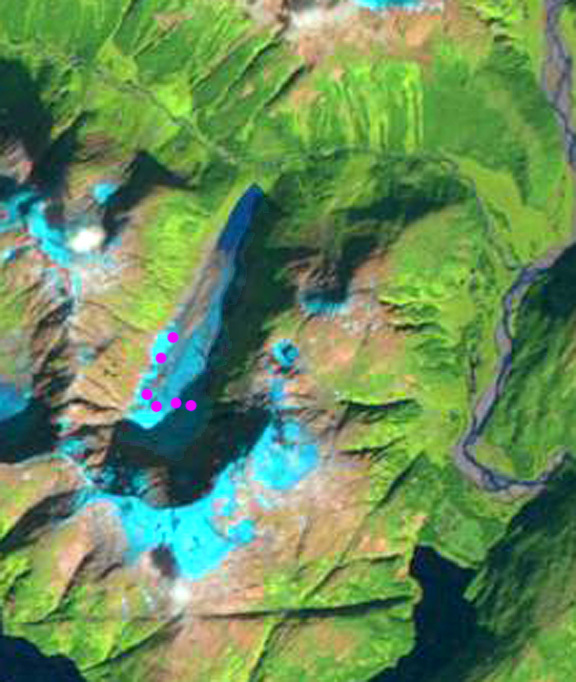 Here we examine Landsat imagery of changes in this glacier from 1984 to 2013. This is a small, remote glacier that receives that has not attracted attention. It is close to the Long Lake Snotel snowpack measurement station operated by the USDA. I observed the glacier in 1998 from a helicopter and thought it did not look poised to survive our warming climate for long. 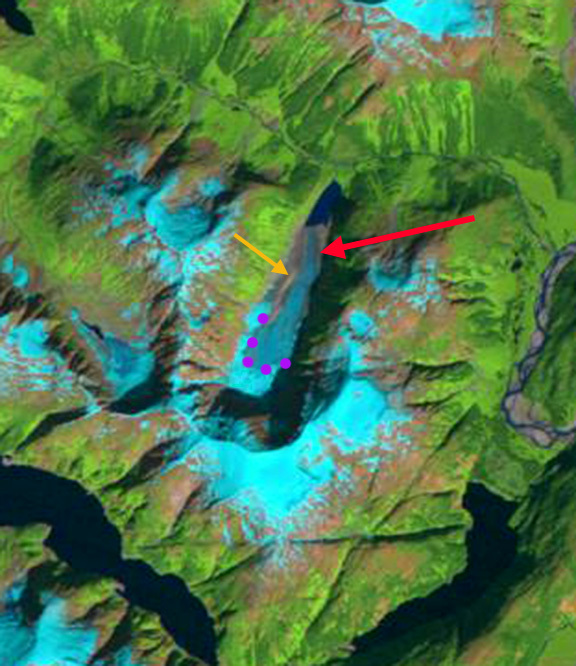 Here we examine Landsat imagery from 1984-2013 to observe glacier retreat and lake expansion. By 1984 the lake had expanded to 750 m in length, with a glacier retreat of 500 m from the mapped terminus. 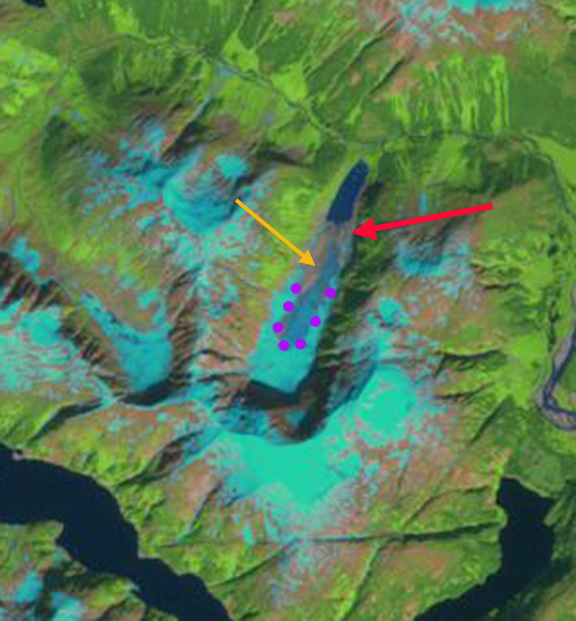 The snowline is marked with purple dots, the 2013 terminus with a red arrow, and the orange arrow indicates a debris covered region of the glacier. Only 20% of the glacier is snowcovered and the melt season is not yet over in the 1984 image. This same pattern of snowcover remaining is seen in 1993, 1995, 1996, 1997 and 1998 for example. By 1999 the glacier has retreated an additional 300-350 m, the snowcovered area is greater but this is an August image. In 2013 a late June and a Late July image depict the loss of snowcover during a month. The overall length of the glacier is now 2.6 km, indicating a retreat of 1200 m since and a retreat of 700 m from 1984-2013. The glacier is still terminating in the lake that has expanded by the same amount. This glacier has not only retreated but also thinned and the slopes above the glacier have greened a bit particularly on the north side. 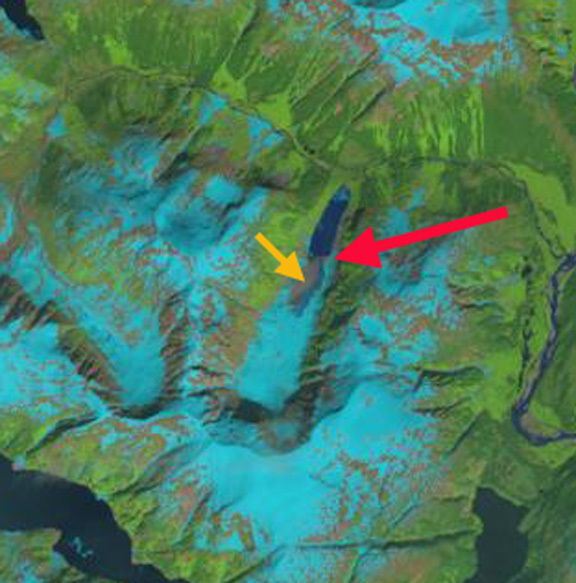 This glacier cannot survive with the level of retained snowcover it has (Pelto, 2010). Ongoing mass balance work on the Lemon Creek Glacier of the Juneau Icefield, where the Juneau Icefield Research Program is beginning measurements next week, has thinned by 29 m during the 1955-2013 period (Pelto et al, 2013). In 2014 the Long Lake Snotel site at an elevation of 850 feet, lost its snowpack on June 11, a bit earlier than normal, indicating this glacier will lose most of its snowpack in 2014. This entry was posted in Glacier Observations and tagged alaska glacier retreat, glacier disappearing, long peak glacier retreat, speel river glacier retreat. Bookmark the permalink.